If you like to camp, you no doubt have wondered how you can get more out of your camping experience. While there’s nothing better than sleeping under the stars, traditional tents can, without a doubt, become overcrowded. This is especially true if you are traveling with a partner, children, or multiple other people. Enter the beauty of a six-person tent. 6 person tents allow you to sleep several people comfortably, all while still providing plenty of room for you to stash your gear. The aptly named Slumberjack Trail 6 Person Tent will allow you to sleep comfortably, without having to sacrifice your space or comfort for portability or style. This option, one of the very best 6 person tents, is a great option for campers seeking a bit more space on their next excursion in the great outdoors. It has received top reviews for its durability and its ability to stay warm and comfortable even in extremely cold conditions. The Slumberjack is one of the most portable tens of its kind. IT offers a myriad of sizes, ranging from smaller two-person sleepers to roomier six-person tents, along with every size in between. The tent itself is constructed of heavy-duty 75D Polyester and has taped seams. These seams help keep out water and make the tent nice and cozy even during cold, blustery winds. It also has several features to promote ventilation. The tent is constructed with mesh wall panels as well as polyester no-see-um mesh to help keep you cool and comfortable, but without letting in bugs. It covers with a full-coverage rain fly as well as two vestibules. This makes the tent ideal for stashing your gear, particularly if you are headed out on a camping trip that requires quite a bit of gear (such as fishing or hunting equipment). Because the tent has sturdy fiberglass poles, you receive the benefit of a lightweight tent (for packing in on backwoods hikes) that is also resilient to high winds. If you don’t want to use the fiberglass poles, you can swap out aluminum poles to make it even lighter. tent, allowing you to enter and exit the tent easily as well. The tent’s ridge poles are designed in a unique fashion as well. These poles are geometric in design, allowing for maximum interior space. 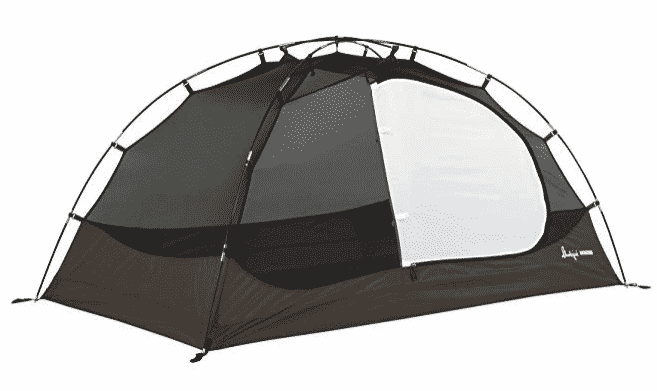 The tent is free-standing, making it easy to assemble while giving you plenty of interior room. It is easy to set-up, with color-coded clips and side-release buckles that allow you to bring the tent together quickly and with minimal hassle. Weighing less than twenty pounds, this tent is a good option for a camper seeking more room on his next camping trip. With 99.3 square feet of floor space, this tent’s dimensions offer much more breathing room than do comparable models. Looking for more information to help you make up your mind? Consider our list of pros and cons to make the decision even easier. Customers appreciate how watertight this tent is. The tent material and rainfly are both constructed of thick, water-resistant material, and are coated with an additional waterproofing layer. You will experience minimal condensation build up inside the tent, even during hot and humid weather. 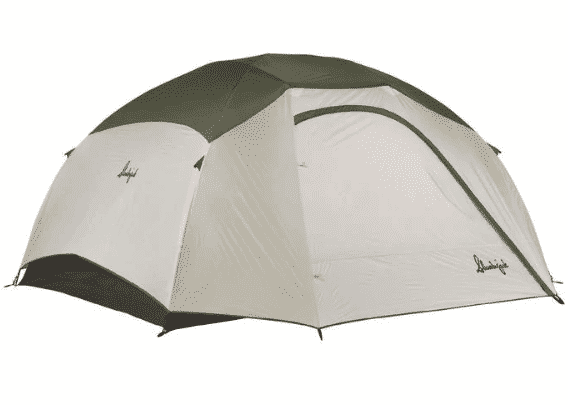 Because of these features, this tent is ideal for camping in inclement weather. It’s heavy-duty without being too heavy to carry and offers maximum portability. It’s a simple tent without many of the bells and whistles of more expensive models, offering everything you need for backwoods or suburban camping at a fraction of the price of similar models. Compared to similar models, this tent is one of the easiest to set up, take down, or even modify if you had the desire to do so. You can add extra tarps, rainflies, poles, or other materials to customize this tent to any camping need, making it an ideal option for someone with diverse needs. Consider purchasing the Slumberjack Trail 6 Person Tent if you’re looking for a no-nonsense tent that will help you get the job done. If you want a tent that will allow you to sleep comfortably without being crowded by your camping partners, this is the tent for you. As one of the most well-constructed 6-person tents on the market, this option is definitely the way to go on your next camping trip – no matter where that may be.